You may suspect a leak in your home's water pipes because you notice that your water bill is much higher than it normally has been. But where is that leak coming from? How would you go about finding that out? The very first step is to check your water meter. The first thing you can do is to check your water meter to your home. They are normally located outside in the front yard, in the sidewalk or in the easement between your front sidewalk and the road. Use a screwdriver or something similar to lift the cover to the meter box. Inside you will see the water meter. If there is a cap on the meter go ahead and remove it to read the meter. On the face of the meter you will see a "leak indicator" which could be a red triangle, a blue circular item or another shape but if it's moving - then that indicates that you do have water running through the meter. If your meter does not have a leak indicator, then look at the sweep hand on the face of the meter. This hand, like the hand of a clock moves very slowly. So, you will want to mark where it currently is, come back in 20 minutes and if that hand has moved, then you know that you have a leak. How To Find A Water Leak Underground? Read our article on How To Find Water Leaks Underground for details on how to determine which one of these two is the cause of your problem. How To Find A Water Leak In A Wall Or Ceiling? We recommend that you hire a professional plumber to do the work to locate that leak simply because of the expertise plumbers have and the specialized equipment that they may need to find that leak. Also, once the problem is found - repairs will have to be made and unless you are a very handyman type of person - using a plumber to make the needed repairs will save you time and money in the long run. Following are 5 steps to finding a water leak in the wall or ceiling. First thing to do is if the affected area is near an appliance such as a washing machine, dishwasher, water heater, etc. - if possible, turn the water valve off. Check those appliances for leaks. It may be that the leak is not coming FROM the wall at all. If the affected area is near a sink or bathtub or shower - the leak may also be coming from there vs. the wall. Check your gutters and downspouts. If excessive rain or melting snow can't drain through the downspout, that water will eventually begin to find it's way through the roof and walls of your building. So, check your gutters and downspouts and remove any debris. Use a moisture meter or an infrared camera to detect the extent of your wet wall and to help you identify where the leak could possibly be coming from. Now, you will have to cut into the drywall and hopefully, if the meters you used are correct, you will find a leaky pipe OR you at least may be able to see where the leak is coming from. How To Find A Water Leak Under A Concrete Floor? If you suspect a leak under your concrete floor, don't hesitate to get the problem fixed as soon as possible. The structural damage that could occur to your home could cost you much, much more than fixing the leak right away. The equipment and expertise needed to locate a leak under a concrete floor is not something that most homeowners have so we urge you to contact us, Atlantis Plumbing. Our leak detection services will find the source of your water pipe leak problem and we can repair the issue. 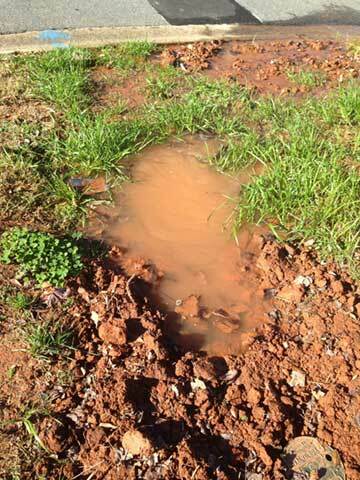 If you have any questions about water leaks in and outside your home, call Atlantis Plumbing today at 770-505-8570. We are available 24 hours a day, 7 days a week.